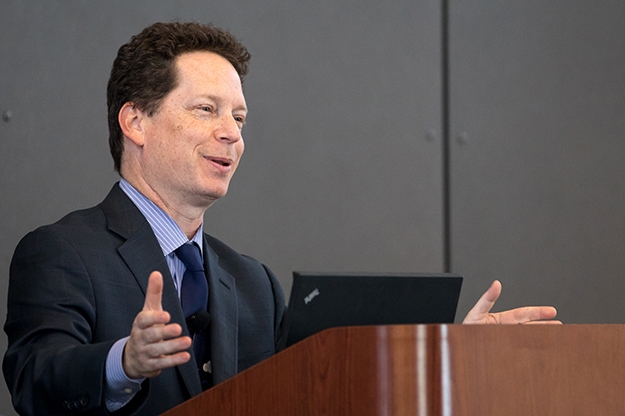 Scott Kennedy, a leading authority on Chinese economics, led an engaging town hall conversation connecting China’s rise in innovation to matters back here in the United States. Kennedy was the fourth featured speaker of UND President Mark Kennedy’s Eye of the Hawk Lecture Series. Photo by Jackie Lorentz/UND Today. Scott Kennedy, a leading mind on China’s economic policies, stood before a Tuesday assembly of UND students, faculty and community members who were hungry for conversation on industry and trade – and started talking hoops. This principle is what guides Kennedy’s work as the deputy director of the Freeman Chair in China Studies and director of the Project on Chinese Business and Political Economy at the Center for Strategic and International Studies. He was invited to UND by President Mark and First Lady Debbie Kennedy as a featured speaker of the Eye of the Hawk Lecture Series, hosted by the College of Engineering & Mines and sponsored by Great River Energy. 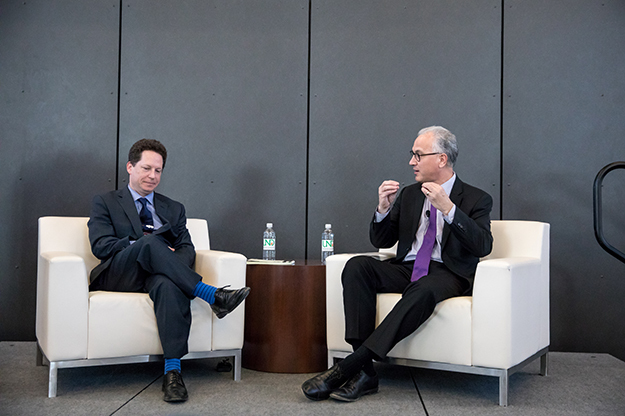 Two Kennedys – Scott (left) and Mark (right) – took the Gorecki Alumni Center stage on April 3, sparking a dialogue on trade, autonomous systems, electric cars and much more. Photo by Jackie Lorentz/UND Today. With three decades of research and travel to China, Scott Kennedy has more than a finger on the pulse of the country’s economy – he’s cut to the heart of it. He’s been working on a three-year project examining China’s innovation trajectory and how the country fits into the global innovation ecosystem. According to Kennedy, China is rapidly improving in the Global Innovation Index and is quickly approaching the level of the U.S. as it continues to spend more and more on research and development. China’s economy is growing at a rate of 7 percent a year. But, Kennedy said, its growth is inefficient and at times unstable, and can be constructive or destructive to certain sectors in the global market. There are countless reasons for North Dakotans to care about the innovation and economic policy in China. The Asian giant is speeding toward increased autonomous development (both commercial and military), one of the areas in which North Dakota – namely UND and its public and private partners – is leading the way for the rest of the country. As China’s development increases, the U.S. must decide how to find a balance between racing toward the finish line and collaboration. North Dakotans must also remember that much of what is grown in the state’s fields is packed up and shipped to China. The U.S. is the largest exporter of soybeans to China, and any fluctuation in trade that affects that relationship will impact the state’s growers. President Donald Trump recently announced penalties against China as a result of their efforts to unfairly acquire intellectual property. On Wednesday, China pushed back by slapping tariffs on more than 100 American exports, including wheat, corn and soybeans. 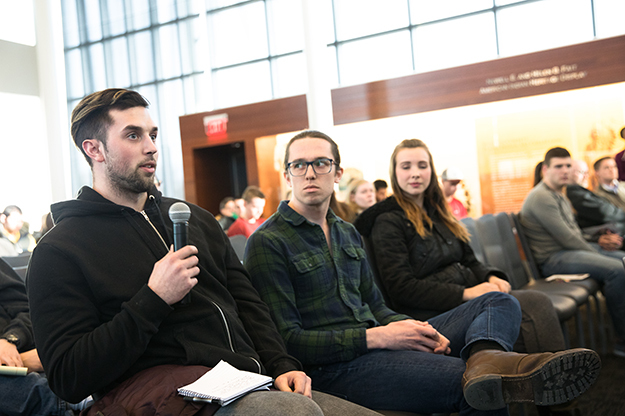 Marshall Nunberg, a senior double majoring in political science and Chinese language & culture studies, asks Scott Kennedy a question during the Eye of the Hawk lecture on China’s role in the global economy. Photo by Jackie Lorentz/UND Today. Most of the seats for the town-hall-style event were filled by students, who came prepared with questions related to their various majors. One of those attendees asked Kennedy what he thought about China’s influence on the landscape of American higher education. 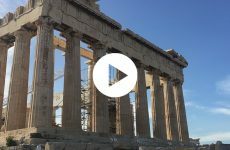 “There are lots of different ways in which China’s rise, or the volatility that China creates, has so many different impacts,” Kennedy replied. 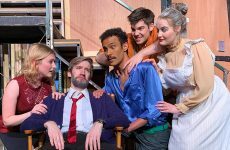 He further explained that, at a campus at which he previously taught as a professor, of the more than 40,000 students enrolled, 3,500 were from China and paying out-of-state tuition. “Now, we are going to reduce the number of visas for Chinese students. We’re going to change that equation, and it’s going to change the finances of some universities who have lots of students from China,” Kennedy said. What happens in China, economically and strategically, may also shift what students study and what skills will be needed to help compete – and/or cooperate – with the Chinese. “If you work in cyber, public health, maritime security, nuclear weapons, space – you’re paying attention to China out of at least one eye,” Kennedy said. Geological engineering student Will Brandenberger and political science/Chinese studies major Marshall Nunberg sat side-by-side as they posed questions about trade and the liberal international order.